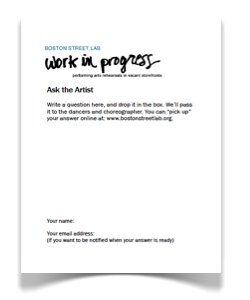 We’ve been experimenting with ways to connect the performing artists and the audience, while minimizing interruptions and disturbances. I like the lab coats. How do you decide on costumes for a piece like this. And what will the storyteller (man) wear at the show? I decided on the labcoats because I like how they clearly delineate the idea of science. Lab coats also protect us- ie separate us from what we are studying. 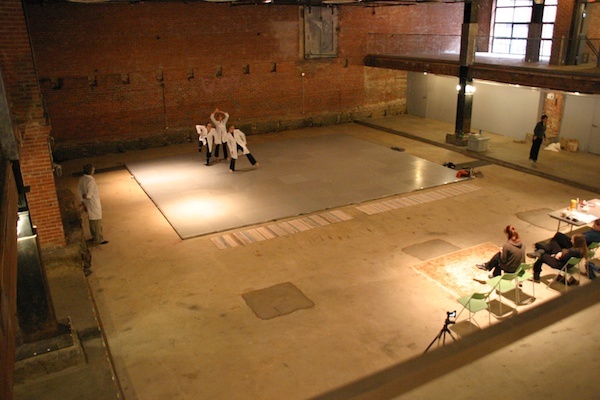 The piece investigates an oppositional idea to this- that of being in unity with the world around us- so starting with the lab coats and eventually shedding them releases us from the artificial barrier we have between ourselves and what we perceive in the world. I think the storyteller, Jon Turk, will wear somthing quite ordinary. Simple pants and a shirt- he is all of us on this journey. The dancers will be more elaborately attired and their costumes will change throughout the evening. The dance costumes will help change and, I hope, enhance the mood of each section. I plan to meet with my costumer, Anna Zamarippa, in the next month to start planning the dancers’ costumes. 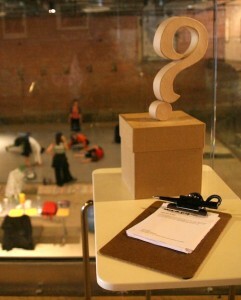 Drop by this weekend during the Fort Point Art Walk and ask a question. Updated schedule here.